Ayers joins 12 other business, civic and cultural leaders from across North America in receiving the 2019 honors. For more than 70 years, the Horatio Alger Award has annually bestowed the award upon individuals who have succeeded despite facing adversities and who have remained committed to higher education and charitable endeavors throughout their lives. Ayers was born in rural Tennessee to a family that was income-dependent upon the success of their family’s saw mill. Early in life, he learned the value of hard work through his first job, shining shoes, at age 8. In addition to contributing what money he could from shining shoes, Ayers also assisted his father and uncle on their saw mill. Later enrolling in nearby Memphis State University, he paid tuition by running a newspaper route and working night shifts at both a local dairy farm and a hotel. After graduating from college in 1965 with a degree in accounting, Ayers explored different careers in his early professional life. In 1984, with the help of a partner, Mr. Ayers purchased Farmers State Bank, and four years later bought the National Bank of Lexington, which would become FirstBank. After becoming the bank’s sole owner, Ayers expanded the enterprise from Tennessee into Georgia and Alabama. After 32 years of private ownership, FirstBank made Tennessee banking history in 2016 when its initial public offering closed at $128.5 million. Ayers remains the executive chairman of the company, which today stands as the third-largest Tennessee-based bank, with assets of approximately $5 billion and nearly 56 full-service locations. In 1999, he established The Ayers Foundation to improve the quality of life for the people of Tennessee, with a specific focus on education. Through The Ayers Scholars Program, scholarship counseling and funding is provided to five high schools and two community colleges in rural areas of West, Middle and East Tennessee. It also supports the children of FirstBank employees and, since its inception, has awarded more than 6,300 scholarships. In 2012, Ayers funded the Ayers Institute for Teacher Learning and Innovation at Lipscomb University to support principals and teachers in better preparing students across the state for college and the workforce. Mr. Ayers and the member class of 2019 will be formally inducted in April during the Association’s 72nd Horatio Alger Award Induction Ceremonies in Washington, D.C.
Tennessee Attorney General Herbert H. Slatery III has selected Jonathan T. Skrmetti to join the Attorney General’s Office as the chief deputy in January. He will coordinate and oversee the substantive legal work of all five sections of the office. Skrmetti joins the office from Memphis, where he has been a partner with Butler Snow LLP, an adjunct professor at the University of Memphis Cecil C. Humphreys School of Law and an assistant United States attorney for the Western District of Tennessee. In that role he investigated and prosecuted civil rights crimes and white-collar offenses. Skrmetti also served as a trial attorney in the U.S. Department of Justice and a special assistant in the United States Attorney’s Office in Washington, D.C. He also clerked for the Eighth Circuit Court of Appeals, assisting the Hon. Steven M. Colloton. Skrmetti graduated from Harvard Law School, where he was the editor-in-chief of the Harvard Journal of Law & Public Policy. He also earned degrees from George Washington University and the University of Oxford. 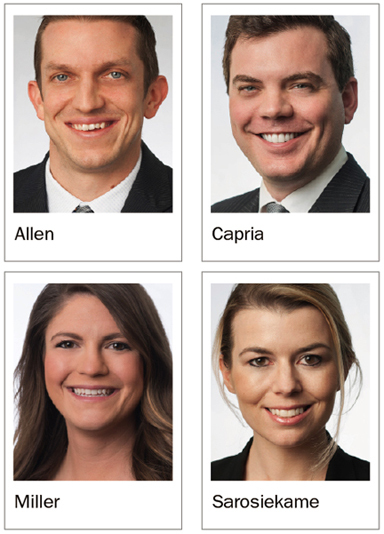 Four Bradley Arant Boult Cummings LLP have been honored for their leadership roles with the Nashville Bar Association. Senior attorney Jeffrey L. Allen and associate Timothy L. Capria each received the NBA President’s Award. Allen was honored for his leadership as co-chair of the NBA’s Entertainment, Sports & Media Law Committee, and Capria was recognized for his role as chair of the NBA’s Diversity Summit. Associates Casey L. Miller and Tara S. Sarosiek both received the Young Lawyers’ Division Enterprise Award for their leadership as co-chairs of the Davidson County Mock Trial Competition. Allen focuses his practice on entertainment and intellectual property litigation, as well as entertainment transactional matters. Capria focuses on acquiring intellectual property, patent opinion practice and enforcing intellectual property rights. Miller is a member of Bradley’s Litigation Practice Group, while Sarosiek has represented corporate and individual clients through investigation by the Securities and Exchange Commission, the Federal Energy Regulatory Commission and various other federal and state agencies. Fridrich & Clark Realty has added 11 experienced brokers and Realtors, including long-time Nashville-area brokers and past Realtors of the Year Tommy Patterson and Richard Courtney, to the firm. All were formerly with Christianson, Patterson, Courtney and Associates. In addition to Patterson and Courtney, Laura Clay, Currey Courtney, Wade Fulton, Kristen Reed Gallimore, Elizabeth Pagano McGuire, Natalie McLaughlin, Stacey Michitti, Kimberly Oliver and Christy Reed have also joined Fridrich & Clark Realty. The addition brings the total number of Realtors at Fridrich & Clark Realty to 159. Patterson has been in the real estate profession for more than 40 years, earning his broker’s license in 1980. He has been with CPCA since 1995 and has served as the firm’s managing broker since 2001. A graduate of Vanderbilt, he was named Realtor of the Year by the Greater Nashville Association of Realtors in 2001 and served as the organization’s president in 2000. Courtney, one of Nashville’s leading Realtors for more than 35 years, has been with CPCA since 1995. He served as president of GNAR in 2007 and received the Realtor of the Year award from GNAR in 2004 and from the Tennessee Association of Realtors in 2007. He also is a long-time member of the Board of Directors of the GNAR, the TAR and the National Association of Realtors. Courtney also is an author with two books published on business and real estate. Community bank First Farmers, which serves Middle Tennessee with more than 20 banking locations in eight local counties, has named Andrew “Andy” Jones as business development trust officer. Based in First Farmers’ Brentwood office, He is responsible for growing wealth management services for high net worth families and institutions with a focus on Williamson and Davidson Counties. Jones comes to First Farmers with more than 28 years of experience serving Middle Tennessee in the private banking and wealth management space. He was most recently vice president of commercial banking with Reliant Bank and previously held roles with US Bank, SunTrust and UBS. A graduate of Sewanee: The University of the South, Jones is also currently pursuing the Certified Financial Planner and Accredited Wealth Management Advisor designations. Cottrell began her legal career in 1976 as an assistant attorney general. Mayor Bredesen named her director of law for the Metropolitan Government of Nashville and Davidson County in 1991. She also served in the Office of Attorney General of Tennessee, including as Chief Deputy Attorney General. In 1998, she was appointed to the Tennessee Court of Appeals by Gov. Don Sundquist and was elected to full terms in 2000 and 2006. She retired from the Court in 2014. Judge Cottrell is also a founding member of the Lawyers Association for Women, an alumna of Leadership Nashville, and adjunct faculty at Belmont University College of Law. Outgoing Brentwood mayor lands on Main St. The Heritage Foundation of Williamson County has hired Jill Burgin, the outgoing mayor of Brentwood, as executive director of the Main Street program. Prior to her role as the mayor of Brentwood, Burgin served as city commissioner for nearly eight years. She spent her early career as an editor for publications in Memphis. In 1991, Burgin moved to Williamson County to serve as editor for Schroeder-Flynn and Company, which led her to a position as copy editor and columnist for Williamson A.M. and later for the Brentwood Home Page. Crosslin has promoted team members Erica Saeger and Jennifer Manternach to the position of audit principal for the company. Saeger has more than 14 years of experience in public accounting, managing audits in a variety of industries, including not-for-profit entities, government, higher education, religious organizations and public companies. Saeger earned both her bachelor’s degree in accounting and MBA from Middle Tennessee State University. Manternach has more than 15 years of public and private accounting experience, joining Crosslin in 2011. She is well versed in both audit and tax for governmental, non-profit, educational and privately-owned organizations. With expertise in compliance and internal controls, Manternach also serves the manufacturing industry and small businesses. She is a graduate of Luther College and is a member TSCPA and the American Institute of Certified Public Accountants.